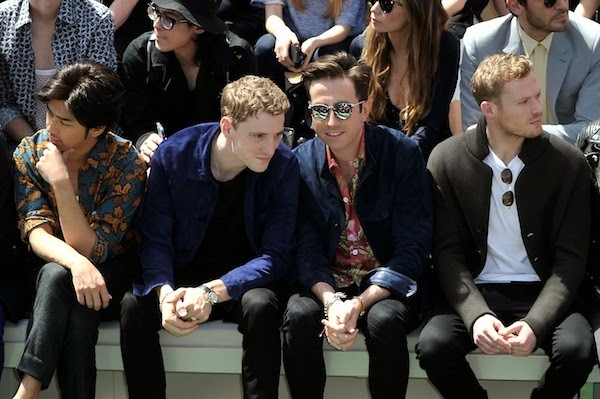 George Barnett attended the Burberry Prorsum Menswear Spring Summer 2015 show as part of London Collections: Men SS2015 on 17 June 2014 in London. The British model / musician wore a mid indigo suede artists jacket over a liquid soft cotton t-shirt, all from Burberry. I took the above picture of George Barnett prior to the show, and asked him a few questions about his personal style. I featured him several times on the blog, and just wondered how he is like beyond the digital prints. Thing is, it is always hectic at the shows and the excitement and energy kind of make everything a blur afterwards. That means I had one too many glasses of champagne and I can't really remember what he said. I can assure you I did not dribble over him, or anyone. His indigo leather jacket was really beautiful and the colour really came alive under the glorious sunshine. I did scribble something in my notebook (alas not one of those stunning leather-bound note books as presented on the runway): "likes a good leather jacket, sometimes into extreme styles. The Klaxons." Very glad to have caught up with George Barnett at the show. The suede jacket was gorgeous and it fitted his style perfectly. A few more pictures coming up, please bear with the slower updates. Meanwhile, you can shop the Burberry Prorsum Spring Summer 2015 collection online from Burberry.com until 24 June 2014. Show us how did you look at the event, pleasee! LOL! I am not the main dish!